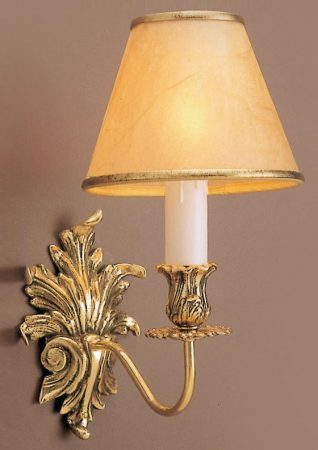 This Impex Dauphine traditional leaf design solid brass single wall light is part of the Brooklands prestige lighting collection. A handmade wall light, with detailed cast leaf wall mount, curved lamp arm, detailed metal candle pan, flower bud wax candle style lamp holder and candle tube. Shown fitted with optional clip-on lamp shades that are not supplied. Impex Lighting are one of Europe’s leading manufacturers who supply a comprehensive ranges of fittings in contemporary, traditional and classic styles like the Dauphine traditional leaf design solid brass single wall light featured here.